Large - $64.99 Only 8 left! X-Large - $64.99 Only 6 left! It's your favorite time of year again, when you blow the dust off your old VHS (or laserdisc) copy of Angels with Filthy Souls and use the ultra-violent audio to play cruel pranks on hapless pizza delivery boys... or scare off bumbling burglars before they break into your house. The film's lead antagonist, Johnny, and his classic line, "Merry Christmas, ya filthy animal!" have given you endless joy and gotten you out of your fair share of sticky situations, so why not show your appreciation this Christmas? 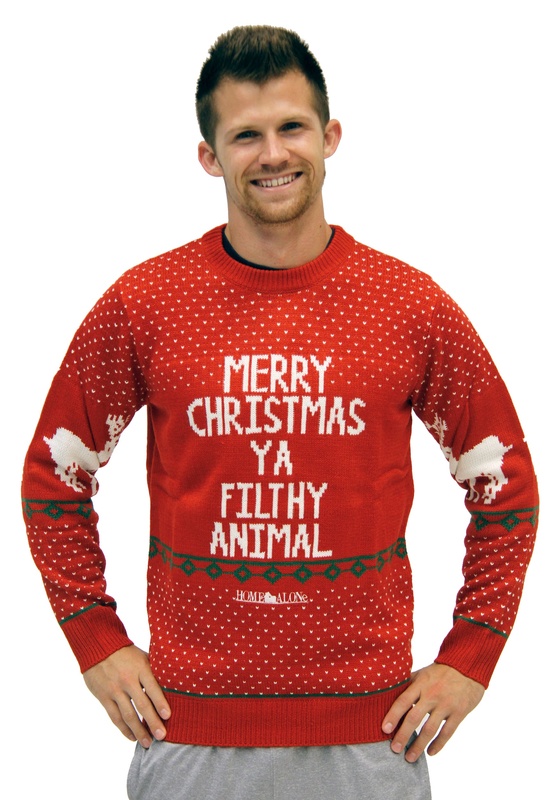 This Adult Home Alone Red Merry Christmas Ya Filthy Animal Sweater is a great way to give a holiday shout-out to one of the greatest movie lines of all time! Of course, Angels with Filthy Souls is only a fictional film from one of the funniest scenes in Home Alone, but the laughs will be very real when you show up to the "Ugly Christmas Sweater Party" wearing this awesome sweater. Even though it's far from ugly, you're sure to win the night with this wearable reference to everyone's favorite Christmas movie!